Maps of Private Land Grant Cases of California. UC Berkeley, Bancroft Library. Berkeley, CA. Land Case Map E-684. What, precisely, is a map? And, more important, what work do maps do? Maps are visualizations of space or spatial relationships. A map of London is not the city itself in the same way René Magritte’s The Treachery of Images is not a pipe. Instead, the map represents London at a more manageable, abstracted scale. A mapmaker proposes that a place looks, or is organized, or can be navigated in a particular way. In the 1980s and 1990s, scholars such as Brian Harley and Denis Wood brought the objectivity of maps into question. Beyond representing space, maps helped to assign meaning and value to space, making them powerful tools for constructing the mapmaker’s version of reality. The image below, for example is a map of a proposed canal, one that the mapmakers hoped would come into being in part because of their map. “Map of the Proposed Stockton Ship Canal and Tule Land Reclamation District.” 1874. California Cultures: Selected Documents from the Bancroft Library. UC Berkeley, Bancroft Library. Berkeley, CA. Map G 04363 S26 P53 1874 M3 Case XB Copy 1 Bancroft. Maps are a highly effective way to make an argument, whether about the density of rat populations in certain New York City neighborhoods, that discriminatory practices called “redlining” enacted in the 1930s contributed to the distribution of unequal wealth in the United States today, or that “hyperconnected” cities have become increasingly important and could surpass nation-states as centers of global power. This also suggests that maps are also a great way to lie or mislead persuasively, however, and it does not even have to be on purpose. When looking at a map, therefore, it is always smart to ask “Who made it?” “Why did they make it?” and “How did they make it?” These are also some of the same questions historians ask when they analyze sources other than maps and are a useful start for critical thinking about any media, historical or contemporary. “General chart embracing surveys of the Farallones entrance to the Bay of San Francisco, Bays of San Francisco and San Pablo, Straits of Carquines and Suisun Bay, and the Sacramento and San Joaquin Rivers to the cities of Sacramento and San Joaquin: California.” c. 1851. Maps of Private Land Grant Cases of California. UC Berkeley, Bancroft Library. Berkeley, CA. Land Case Map E-684. The image above is a map of the San Francisco Bay Area of California from the early 1850s. Fred D. Stuart, hydrographer for the United States Exploring Expedition (Follow the US Ex Ex here) drew the map at the request of a set of California citizens (listed in columns at upper center of the image), including then-governor of the new state Bennet Riley. The map is presumably based on Stuart’s records from the US Ex Ex survey of San Francisco Bay and upper California in 1941. In the bottom left corner of the map, cramped text reads: “Entered according to act of Congress in the year 1851 by Cadwalader Ringgold in Clerks office of the District Court of the United States for the District of Columbia,” which means that immediately after completion, the commissioners submitted the map to Congress to be the official record of the bays, straits, rivers, and cities it represents. This was important to these California citizens because they, as relative newcomers to the area, understood that federal recognition would give their territorial claims the greatest advantage in future legislation and litigation. The map is substantial in size, but not large for the time, just 50 x 76 cm (19.69 x 29.92 inches) drawn at a scale of approximately 1:246,000, meaning every inch on the map represents 246,000 inches (20,500 feet or 3.88 miles) of actual topography. The numbers around the edge of the map are degrees of latitude and longitude. Like most American maps, this one is oriented with north at the top, as suggested by the compass in the lower left quadrant that marks both true North and the variation from magnetic North. The majority of early Islamic mapmakers oriented their maps southward because most Muslim societies at the time resided north of Mecca. Medieval Christian cartographers placed Jerusalem at the center of their maps and oriented them with East at the top because that is the direction from which the sun rises. The Hereford Mappa Mundi, dated to 1300, is one example. Stuart illustrates relief (the cartographic term for elevation) with hachures, spot heights, soundings, and isolines. The 1851 chart of San Francisco Bay is not a topographic map, meaning its purpose is not to provide systematic measurable representations of relief, but it does not visualize the Bay Area as flat. Hachures are the lines of shading on the sides of hills or mountains meant to give the impression of steepness. There are many examples of hachures on this map in the area around San Francisco. Spot heights are numbers marking the elevation of a point, usually above sea level. Soundings are measurements of the depth of water, historically with a line and lead but today more often by echo. The map of Point Reyes and Drake’s Bay below records soundings in a zig-zag pattern along the coast that track the traversing path sailing ships had to navigate along coastlines because of the nature of wind power. The numbers on the face of the San Francisco map, then, measure either elevation above sea level when they sit on land or depth below sea level when over water. Isolines, or contour lines, are the fainter, curving lines on the map that work roughly like contour lines to mark elevation change. There are only a couple of isolines on this map, which Stuart roughly tracked with sounding measurements and spot heights. 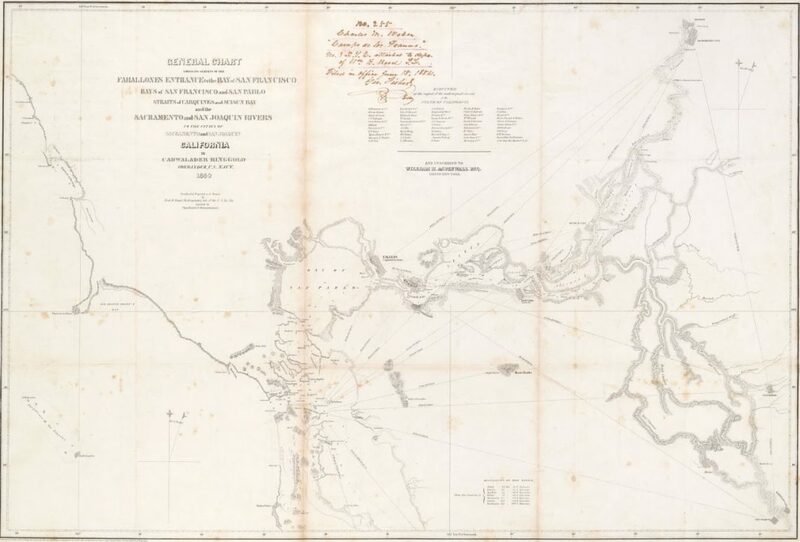 “Preliminary survey of Point Reyes and Drake’s Bay, California.” United States Coast Survey. 1855. California Cultures: Selected Documents from the Bancroft Library. UC Berkeley, The Bancroft Library. Berkeley, CA. Map G 04362 D69 P5 1855 U5 Copy 2 Case A Bancroft. Once you understand the basic information about where the information on the map came from, and the person who created it, the next step is to think critically about it. Following the principles of critical cartography presents several effective starting points. In this case, Stuart, his assistant Charles Everett Jr, and the group of Californians who commissioned him to draw the map each had an interest in the features highlighted and included on the map. As noted above, Stuart was a hydrographer, which means that his interest and training was concerned foremost with water. Despite the fact that, like most American maps in the nineteenth century, this one treats water a mostly negative space and illustrates the terrain only of land, this map also focuses on waterways. It includes, for example, a table of distances between sites by river just off the center in the lower right quadrant. Sounding measurements extend from the mouth of the Bay far into the rivers. Lightly marked and spread out hachures signify or coasts and banks that become covered by water with the tide or change of season. The men who commissioned the map almost certainly chose a hydrographer for the job at least in part because they wanted proof of the navigability of the Sacramento and San Joaquin Rivers and the viability of maritime trade in the cities of the same names. The expanses of blank space reflect the commissioners’ lack of interest in a “complete” portrait of the region more than they do ignorance of topography, unlike the “Americque septentrionale” below, for which the creator Nicolas Sanson would have compiled information from every other map of North and Central America available to him in the 1670s in order to create the most complete portrait possible. “Americque septentionale.” Nicolas Sanson. c. 1679. California Cultures: Selected Documents from the Bancroft Library. UC Berkeley, Bancroft Library. Berkeley, CA. Map G3300 1670 .S3 Case A Bancroft. The work of the US Ex Ex, and their maps especially, advanced US colonization in western North America and Oceania. The maps both facilitated US control over spaces far from the cities with concentrated political power on the Atlantic Coast, and also projected an illusion of territorial continuity. One of the ways that maps do this is by dehumanising the landscape; removing human bodies and even markers of habitation from the surveyed territory. Another method is to record English-language names for places on the map. Naming is often an important part of the process of claiming a place and place-names are intertwined with culture and history. Maps have long served to reproduce and extend the power of their creators, but they can also be put to work on behalf of people or groups who look to contest ownership or control over spaces. Maps are products of their time, place, and creators. They can serve multiple agendas and the significance of the information they communicate changes over time and for the different people who use them. The handwritten note at the upper center of the map reveals that this map served a new purpose in 1854, when a Charles M. Weber submitted it as evidence in a land case to the US District Court of California’s Northern District. When the United States annexed California as a state in 1850, the government had to contend with competing territorial claims from recent US American immigrants who moved into the area? and the more established, formerly-Mexican Californio population. The US federal government had pledged to honor the land claims of Mexican residents when they claimed California in the Treaty of Guadalupe Hidalgo, signed 1848. The treaty recognized no Native American territorial claims. Not everyone respected that pledge—especially after news of gold in the Sacramento Valley that same year produced one of the largest gold rushes history. In fact, new arrivals had a vested interest in undermining the property rights of Californios because the established communities already held the majority of the most valuable land. In order to receive recognition for their property rights, claimants had to submit evidence of ownership for review in district courts. Courts in California continued to adjudicate such claims for many years after the treaty. Weber’s land isn’t marked on the map, but Weber evidently thought it would be aid in validating his land claim. Another map filed within the same land case, a “Plat of the Rancho Campo de los Franceses,” suggests that by 1858 the court had confirmed Weber’s claim. Weber was not the only person to see value in this map for the purpose of claiming land in California. Claimant “Agustin Juan” (likely Juan Agustín) also submitted this map to California’s North District Court in his own land case. His name and land case number are visible on a label at the bottom right of the image. Learning to analyze historical maps illustrates the same methods readers need to critically engage with information created in multiple media in the world around them, both in printed and digital form. As the recent epidemic of “fake news”—only one phase in a long history of politicized misinformation (not to mention a Great Moon Hoax)—has dramatically shown, analytical skills are, and will remain, crucially important outside the classroom. Historians are uniquely positioned to demonstrate how to read documents such as maps, and to make sure to consider who created the map or document, the context for creating the map or document, and how the map or document has been used over time. Chart (n.) Special-purpose map designed for navigation or to present specific data or information. The term “chart” is applied chiefly to maps made primarily for nautical and aeronautical navigation, and to maps of the heavens, although the term is sometimes used to describe other special-purpose maps. Contour (n.) Imaginary line on ground, all points of which are at the same elevation above or below a specific datum. Elevation (n.) Vertical distance of a point above or below a reference surface or datum. Grid (n.) Network of uniformly spaced parallel lines intersecting at right angles. When superimposed on a map, it usually carries the name of the projection used for the map- that is, Lambert grid, transverse Mercator grid, universal transverse Mercator grid. Hachure (n.) Any series of lines used on a map to indicate the general direction and steepness of slopes. The lines are short, heavy, and close together for steep slopes; longer, lighter, and more widely spaced for gentle slopes. Latitude (n.) Angular distance, in degrees, minutes, and seconds of a point north or south of the Equator. Longitude (n.) Angular distance, in degrees, minutes, and seconds, of a point east or west of the Greenwich meridian. Neatline (n.) Line separating the body of a map from the map margin. On a standard quadrangle map, the neatlines are the meridians and parallels delimiting the quadrangle. Orientation (n.) Establishing correct relationship in direction with reference to points of the compass; the state of being in correct relationship in direction with reference to the points of the compass. Plat (n.) Diagram drawn to scale showing all essential data pertaining to the boundaries and subdivisions of a tract of land, as determined by survey or protraction. As used by the Bureau of Land Management, the drawing which represents the particular area included in a survey, such as township, private land claim, or mineral claim, and the lines surveyed, established, or retraced, showing the direction and length of each such line; The relation to the adjoining official surveys; the boundaries, descriptions, and area of each parcel of land subdivided; and, as nearly as may be practicable, a representation of the relief and improvements within the limits of the survey. Projection (n.) Orderly system of lines on a plane representing a corresponding system of imaginary lines on an adopted terrestrial or celestial datum surface. Also, the mathematical concept for such a system. For maps of the Earth, a projection consists of 1) a graticule of lines representing parallels of latitude and meridians of longitude or 2) a grid. Relief (n.) Elevations and depressions of the land or sea bottom. Scale (n.) Relationship existing between a distance on a map, chart, or photograph and the corresponding distance on the Earth. Spot height/spot elevation (n.) Point on a map or chart whose height above a specified datum is noted, usually by a dot or a small sawbuck and elevation value. Elevations are shown, on a selective basis, for road forks and intersections, grade crossings summit of hills, mountain. Survey (n.) Orderly process of determining data relating to any physical or chemical characteristics of the Earth. The associated data obtained in a survey. An organization engaged in making a survey. A “cadastral survey,” commonly called a “land survey” or “property survey” is a survey relating to land boundaries, made to create units suitable for title transfer or to define the limitations of title. A “hydrographic survey” is a survey of water area, with particular reference to submarine relief, and any adjacent land. “Representation” has been used here to avoid jargon, but for an effective break down of why the term is inadequately vague for cartographic theory in “Ce n’est pas le monde (This is not the World)” in Rethinking Maps: New Frontiers in Cartographic Theory, Martin Dodge, Rob Kitchin, and Chris Perkins (eds.) (London: Routledge, 2009): 189-219, but the term has been used here to avoid specialist jargon. The most immediately influential of these groundbreaking texts was Denis Wood’s The Power of Maps (New York, 1992), which remains a staple in cartographic analysis. Jeremy Black, “Cartography as Power” in Maps and Politics, Jeremy Black (ed.) (London: Reaktion, 2000), 17. Black, “Cartography as Power,” Maps and Politics, 21. John R. Eperjesi, “Basing the Pacific: Exceptional Spaces of the Wilkes Exploring Expedition, 1838-1842,” Amerasia Journal 37:3 (2011), 2. Rob Kitchin, Martin Dodge, and Chris Perkins, “Power and Politics of Mapping” in Rethinking Maps, 390. See Doreen Massey, “Places and Their Pasts,” History Workshop Journal 39 (Spring 1995): 182-192; Keith Basso, Wisdom Sits in Places: Landscape and Language Among the Western Apache (Albuquerque: University of New Mexico Press, 1996). Jesse Siddall Reeves, The Treaty of Guadalupe-Hidalgo (New York: 1905), Library of Congress, E408.R3 MEADE, via HathiTrust <http://catalog.hathitrust.org/Record/009607163>. Mark Rifkin, Manifesting America: The Imperial Construction of US National Space (Oxford: Oxford University Press, 2009), 151-153. An Act to Ascertain and Settle the Private Land Claims in the State of California, 31st Cong., 2nd sess., 1851, Chap. 41, via Library of Congress <http://www.loc.gov/law/help/statutes-at-large/31st-congress/session-2/c31s2ch41.pdf>. For more on this, see Kevin Levin, “The Remedy for the Spread of Fake News? History Teachers,” Smithsonian.com, <https://www.smithsonianmag.com/history/remedy-spread-fake-news-history-teachers-180961310/>. Definitions from Maps for America: Cartographic Products of the US Geological Survey and Others, Third Edition (Washington, DC: US Government Printing Office).